Considering divorce? Learn about your options and next step. Divorce is one of the most emotional and uncertain situations a family can face. It’s a time when you’ll have to make many decisions – from living arrangements and finances to parenting in a new reality – while keeping in mind your own best interests and those of the people you love. And, you will be doing this in an unfamiliar legal landscape. Read how someone just like you dealt with that question. 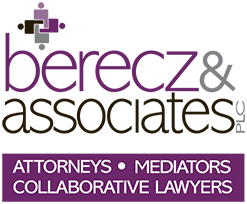 At Berecz & Associates, PLC our family law and divorce attorneys are committed to helping you move through the divorce process with dignity and respect. We will equip you with knowledge about your options to help you make the best decisions for your future. One of the biggest fears most people have about divorce is going through a costly, conflict-ridden courtroom battle. In actuality, statistics show in Michigan only 2% of divorces end in a trial. In 98% of all instances, spouses come to resolution before a trial. So, what does this mean for you? It means you have options. Options we can help you understand so you can choose one that best honors your commitment to yourself and those you care most about. Our family law and divorce attorneys can meet with you to discuss how each option relates to your individual situation. There is no “right” way. Only the way that best fits your needs. We represent people throughout West and Southwest Michigan. Contact us today.